So do you want to Shred ... for your wedding like Seb! Seb Costello signed up to be our first ambassador for the FITNESS RING, when he announced his wedding this year. Tonia and Nick approached him about coaching him and getting Seb shredded for his wedding. Tonia and Nick knows the journey of getting fit for that all important date so ease the stress and come on the day to impress Seb was asked to be a training ambassador to inspire others to do the same in the name of good health fitness and loads of fun. Being videoed and shown through the routine is all part of being an ambassador. This process allows a raw and emotional journey from ordinary to extraordinary as Seb prepares for that all important day. But just like anyone going through the same process you come to realise that it's all the same. Accessible, fun, energising, dynamic and the only person holding you back is you! Seb, Tonia, Nick and all the trainers at the FITNESS RING invite anyone looking to get fit for their wedding day and make some real life decisions. To book in at the FITNESS RING and start making life changes about healthy eating and regular exercise through the ultimate in fitness training - boxing. Follow Seb Costello as he prepares for his big day. Enjoy his personal growth and training. The best way to break old habits, get in shape and discover your inner champion, is to have fun and really enjoy yourself in the journey. Achievement comes from you. It's always a personal journey. This is personal training at it's best. Please don't hesitate to email or Call Tonia 0407 961 874 Today. Each week for the next 4 months we are tracking Seb's progress. The journey is so important! A wedding might be one life changing step for Seb Costello, but his health and well being leading up to that day will be just as life changing as he prepares to develop healthy habits and have loads of fun along the way. We at the FITNESS RING really hope you'll get behind us and follow his journey. Every part of the fitness journey will at some stage be documented and posted. Seb and the FITNESS RING really want to show people what it really takes to become fit and healthy and shred for your wedding. Look's like Seb's got this part covered! Check out or BODY SCAN and WEIGH IN Video on Facebook and Instagram. From stretches to shadow boxing, skipping to bag work, every part of the boxing training will be explored. This is real training, accessible to all, and we want to show people what the process is to not just look good for your wedding, but for life. Check out Seb's WORKOUTS and INTERVIEWS Video on Facebook and Instagram. Part of the FITNESS RING'S secret is personal training. One-on-one access to experienced dedicated trainers that really know how to move and tone your body. Nick is a world champion, so he has really been in the ring and knows first hand how hard it actually is to earn that title. He loves training Seb and they keep their sense of humor rolling. SEB COSTELLO - YOU CAN DO IT! Get behind Seb and the trainers at FITNESS RING and follow this epic 4 month Journey through social media. 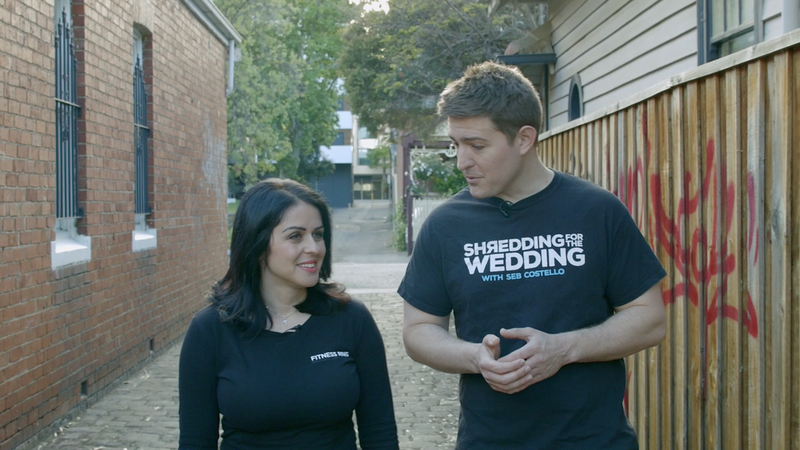 FITNESS RING would like to thank Seb Costello for being or ambassador and demonstrating his charm, wonderful attitude, candid approach and serious commitment to be filmed while Shredding for his Wedding! If you are serious about getting in shape for an major event, like a wedding or just over all fitness for life. Seriously call Tonia Today. Marriage is for life and fitness is for life too. There is so much good will, fun and positive energy in this, it's contagious. We should all have Seb's wonderful attitude and commitment to health and well being. Seb's journey starts out with taking the first steps towards a better you. Seb's not perfect! He confesses to have a habit of enjoying KFC a little too much. In his job he is up early and is time poor. He work's hard, has fun and enjoys life as much as he can. But if FITNESS RING can motivate him each week, we are sure to motivate anyone who is willing to improve themselves and bring that champion attitude to their own lives. Stay tuned and please don't hesitate to email or call Tonia 0407 961 874 Today.